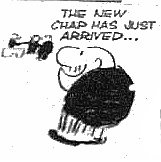 Hot on the heels of the pensioned-off Himple steps a "new man", introduced in strip no 7 in October 1961. Hewitt delights in wasting time whilst ostensibly teaching the job but in reality how to drink tea. Bristow tries to calculate his pay, then seriously worries that he may lose his job. The new man goes too far when he starts flicking ink pellets and then, just as he has Bristow well and truly rattled, he hands in his notice and departs. Only readers of the Aberdeen Press and Journal would have seen the full story. and then makes the fatal mistake of trying to out-talk Fudge. Result, one dismissal and massive schadenfreude all round. 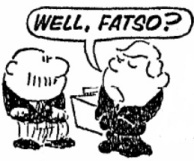 In November 1963 Bristow hears some unwelcome news - a new man is due to start. Cue fists beaten on desk and a mournful cry "Suddenly I'm nineteenth in line for chief buyer". He quickly develops a cunning plan involving squeezing the telephone receiver all morning so as to build up the strength in his fingers with which to put the unsuspecting Charteris out of action at the first handshake. Unfortunately his victim seems to have the same idea. Strip 878 was published in the Evening Standard in November 1963. Apologies for poor quality of scan from microfiche. using the hapless Bristow as his stooge but he is sadly disillusioned when Bristow steers the unsuspecting Miss Sunman into his sights in strip 1428. - but they don't hit it off.
. But life catches up with him in the shape of a tough cookie called Agnes. In no time his hair is trim, he sports a bowler and a steady wage in a 9-5 job is his heart's desire. Barker leaves in April 66 and the following month a potential replacement provides Bristow with a headache. For young Mr. Tyson, at once the apple of Fudge's eye, is arrogant, lazy and downright rude to the only man who can see through him. The behaviour of young Tyson (our "our Terry" as the infatuated Jones calls him) provokes a real crie de coeur from Bristow in strip 1637 . - and he departs forthwith.